So the dark blue menu is the main menu, and the light blue lower menu is the children of Help. How can I set my menu up so that it functions like this mockup? Also, I don't want this to be a dropdown menu. I want the children to stay open while you are on either the parent page or on one of the child pages. UPDATE: I set it up the way you suggested, but instead of displaying the children in the sub-menu, it displayed the main menu and made the Help link a dropdown. Here is a pic of what happened. There are two ways I know of to achieve this. The first is configuring Drupal core's primary and secondary links functionality and some theming, the second is the Menu Block module. If your theme utilizes the primary and secondary links variables you can configure the behavior you're looking for in the Menu Settings area. 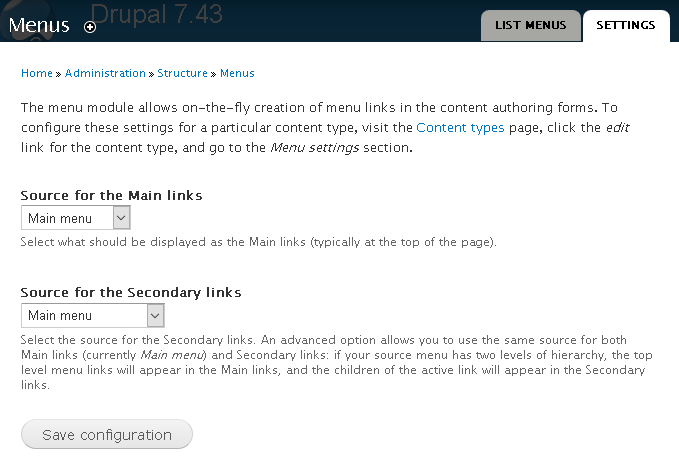 Drupal also provides two default system menus called "Primary links" and "Secondary links". ... A powerful feature of this primary/secondary system is when you choose the same menu as the source for both theme variables. In this case, the two menus magically couple together, and the Secondary links shows you the second level of items from the menu for the page that you are on. Here is a free Drupalize Me Video that shows the process in Drupal 6, it's very similar in Drupal 7. For this example I used the Main Menu that is default in core, but you can use any menu. 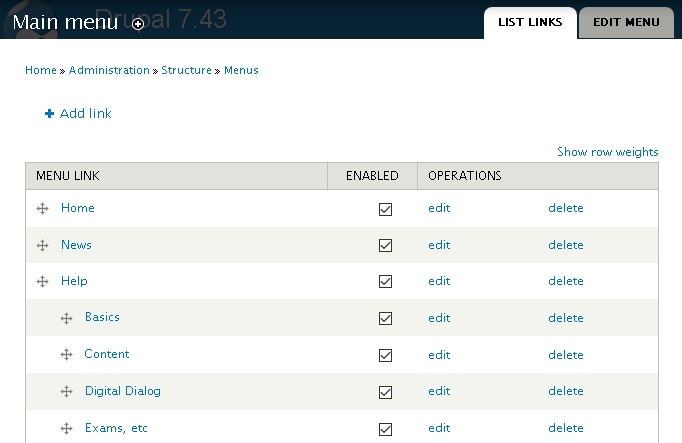 On the menu settings page (Admin > Structure > Menus > Settings or http://example.com/admin/structure/menu/settings) set both the 'Source for the Main links' and 'Source for the Secondary links' to your menu. When you visit your Help page the secondary links displayed will be the children of the Help menu link. And the child links will stay open while you are on either the parent page or on one of the child pages. In the Bartik theme the secondary links are located in the top right of the page. To match the layout of menus in your screenshot, you would most likely need to make theming adjustments as the Primary and Secondary links are not blocks configurable on the Admin > Structure > Blocks page. At the theme layer the variables are $main_menu and $secondary_menu. [P]rovides configurable blocks of menu trees starting with any level of any menu. ... if you’re only using your theme’s Main menu links feature, you can add and configure a “Main menu (levels 2+)” block. That block would appear once you were on one of the Main menu’s pages and would show the menu tree for the 2nd level (and deeper) of your Main menu and would expand as you traversed down the tree. Not the answer you're looking for? Browse other questions tagged 7 or ask your own question. How to add another navigation bar/block at the top of your site? How do I distinguish menu items without children and display different content in panels or views? How to get first submenu item path? How to stop animation and turn off the delay time in superfish menu? How to keep “active” css on menu item when clicking on other link on same page?